This past Saturday, I had the honor of hosting our team meeting to share all of the wonder and excitement of convention with my team! We had 20 of us there! I absolutely love each and every one of these ladies! They are my treasures -- and we always leave excited and inspired by each other! 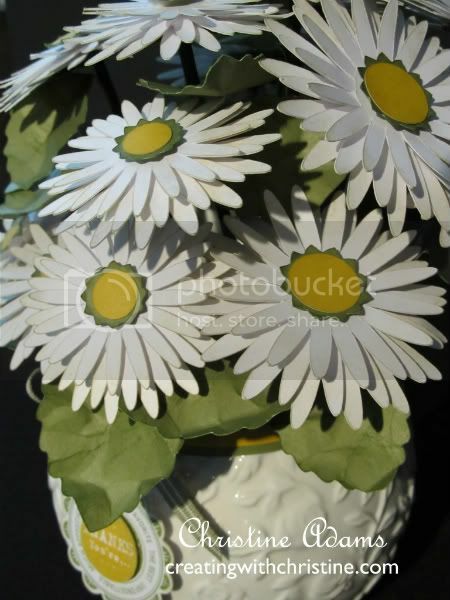 In addition to making their own little cricut gift bag for their Mickey Mint Meltaway (see post below) we also made these little daisy pots. It needs a cute little tag - which is easy enough with this cricut cartridge and SO many to choose from! 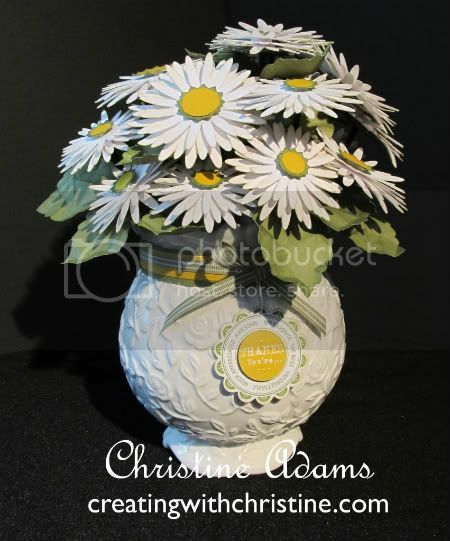 Here is a similar pot of daisies that I made to display at my Extravaganza class using the same flowers in a couple different sizes. I also added leaves (crumpled and inked). This is a tag from the cricut that coordinates with a stamp set that is included in the cricut bundle! Cute,huh? 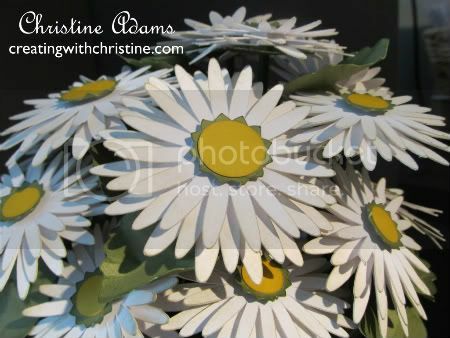 To make the flowers I used 3 different sizes of the flat daisy image (2", 2 1/4", 2 1/2") and layered them with 3-D foam tape. Then layed them in a box - sprayed them with a spray on adhesive, placed them in my glitter tray and added prisma glitter. OR you can just ink the edged with a little Desert Sand ink for dimension and leave them plain. 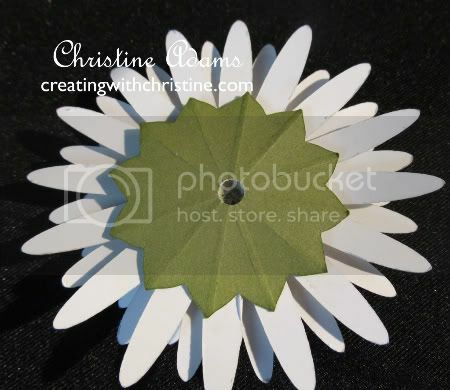 I added a different flower image in olive at 3/4" topped with a circle shape 1/2" in honey. Then I added another Olive colored flower shape on the bottom (for the petals to grow out of) and to attach to the wooden stem. I used our soft-set eyelet tool to create a hole just large enough for the wooden stem to go through. 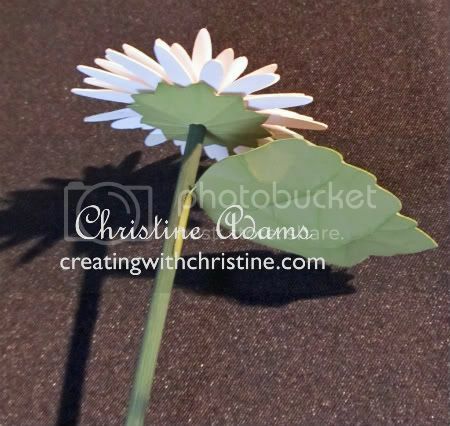 I put 3-D foam tape around the inside of the hole to attach the green flower to the white daisies and the green flower to the stick. I then added a leave image from the cricut cartridge - crumpled and inked. 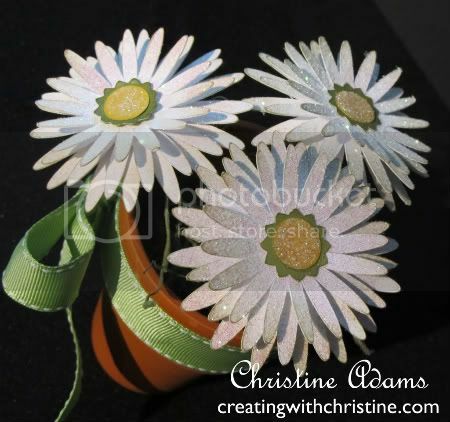 Creating with this cricut cartridge is SO easy and SO MUCH FUN!!! Stay tuned for even more creative fun! 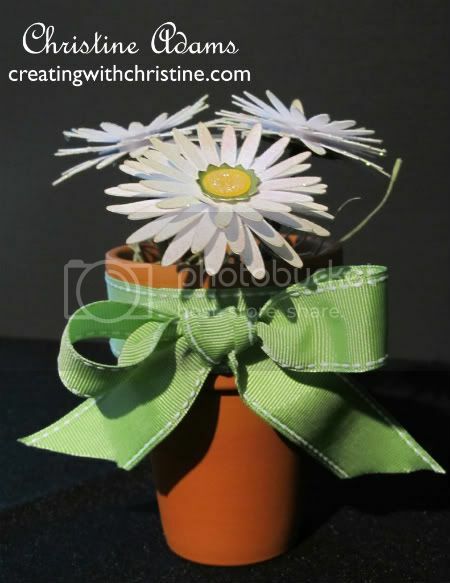 Very cute Christine, Thanks for sharing how you made the bouquet.